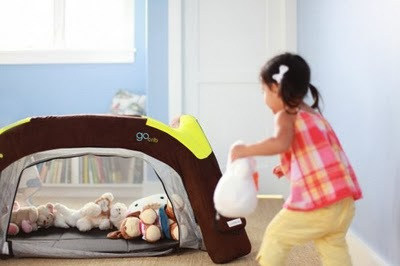 The Guava Family GoCrib Inflatable Crib is an inflatable travel crib/playpen for kids. 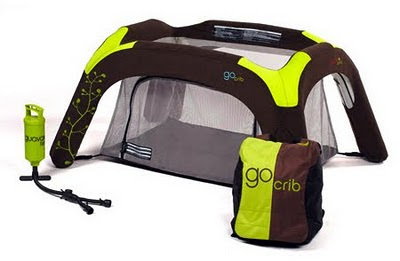 The big advantage the GoCrib has over other travel cribs (Pack n’ Play, etc) is that it is extremely lightweight (about 7 pounds) because it has no metal parts or large plastic components. For comparison, the Pack ‘n Play GoCrib Inflatable Crib weighs well over 20 pounds. 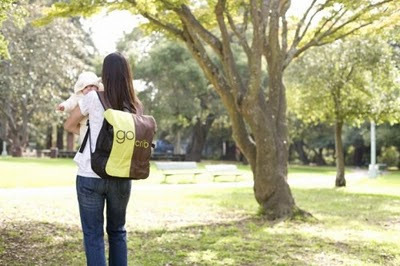 The GoCrib folds down small enough to fit in the included backpack with the pump. Which leaves your hands and arms free to….hold your baby: The mesh sides unzip so it can be used as a play area for slightly older children too. The rigid inflation and wide base keeps it sturdy and in place. The pump inflates the crib in less than one minute. Packed up, it’s small enough to fit in the overhead luggage compartment on an airplane. Great for traveling whether it’s long distance or just to the local park or beach.